I've started looking at the Parallel.For and Parallel.ForEach methods from .Net 4's Task Parallel Library. Before I use something as complex and potentially dangerous as this I like to test it out to make sure I'm going to get that performance boost before going down that path. 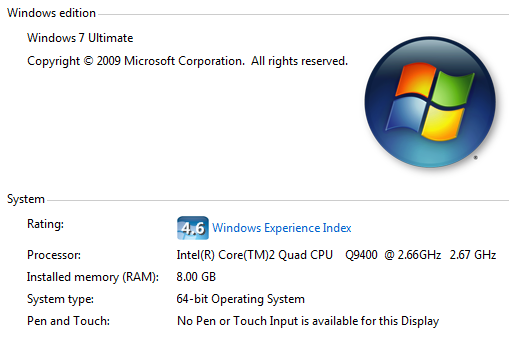 I ran this a number of times on a quad core machine (Intel Core2 Quad Q9400 @ 2.66GHz) on Windows 7 x64. Average time for the sequential loop was 14.7 seconds and for the parallel loop was 5.6 seconds for a ratio of 2.6 times faster using the parallel loop. This is seems right., you're going to get a loop like this to be about Core-1 times faster because the thread management will "cost" you one of your cores. So on an 8 core machine expect this loop to be 7 times faster and on a quad expect 3 times which is what I almost got.